Schmitz, L. & P.C. Wainwright (2011). Nocturnality constrains morphological and functional diversity in the eyes of reef fishes. BMC Evolutionary Biology, 11: 338. html, reprint. We have several really interesting results. The eye morphology of nocturnal reef teleosts is characterized by a syndrome that indicates good light sensitivity. Nocturnal fishes have large relative eye size, high optical ratio and large, rounded pupils. However, there is a trade-off. Improved optical light sensitivity comes at the cost of reduced depth of focus and reduction of potential accommodative lens movement. Diurnal reef fishes, which are released from the stringent functional requirements of vision in dim light, have much higher morphological and optical diversity than nocturnal species. 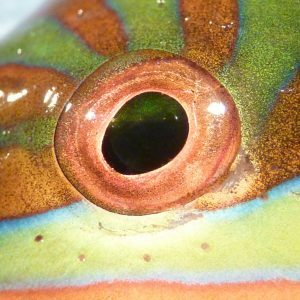 Diurnal fishes have large ranges of optical ratio, depth of focus, and lens accommodation. This paper is the first outcome of the analysis of a data set on the eye morphology of 265 species in 43 families of teleost reef fishes. It’s an enormous amount of data. All in all, we measured 5 traits in both eyes of 849 specimens, resulting in one of the largest data sets on eye morphology ever assembled. One aspect I would like to stress is that we measured eye morphology on fresh fish (in accordance to the UC Davis animal care protocol). The fixation process that preserved specimens went through may have altered eye morphology, so we wanted to avoid this potential problem. I also would like to highlight one of the analyses in our paper. We assessed morphological diversity of diurnal and nocturnal species by calculating the combined variance of all shape axes of a principal component analysis. However, there are far more diurnal (n=211) than nocturnal species (n=54) in the data set, and ultimately the results may be biased because of uneven sampling. Inspired by a suggestion from David Bellwood we designed a simple rarefaction analysis. We randomly re-sampled 54 diurnal species (matching the number of nocturnal species) without replacement and calculated variance on PCs 2-5, and repeated this procedure 100, 000 times. This resulted in 100,000 PC analyses with the same number of diurnal and nocturnal species, with diurnal species randomly selected anew for each run. Then, we compared the distribution of nocturnal variances to the bootstrap distribution of diurnal variances. The results are convincing and, importantly, should no longer be biased by uneven sampling. The rarefaction is easily done in ‘R’; let me know if you are interested in the code. Finally, here are thumbnails of all figures in the paper, with links to the corresponding to the high-resolution files. Feel free to use for teaching purposes.